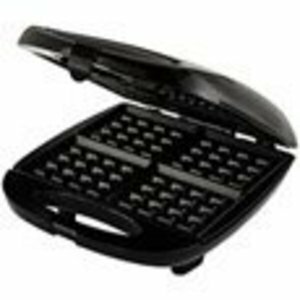 Take a moment to enjoy even those busy weekday mornings with a plate of delicious homemade waffles with the help of this easy-to-use waffle maker by the Oster brand. The unit can cook up four square-shaped waffles in a matter of minutes, and it accommodates both store-bought mixes and batters made from scratch. Bake up anything from healthy whole-wheat waffles with slices of banana on top to more decadent waffles on the weekend-complete with butter and warm maple syrup or fresh summer berries and whipped cream. For those who can't help but hit the snooze button one too many times, there's also the option of making waffles ahead of time and freezing them for quick reheating later-a nice alternative to cold breakfast cereal any day of the week. The unit's cooking plates not only create the familiar waffle pockets that help trap a variety of favorite toppings, but they also provide a nonstick surface to help ensure effortless food release and quick cleanup. Other highlights include a locking handle that stays cool to the touch, automatic shut-off for safety, sleek black housing, and a flat base that allows for standing the unit upright when not in use-great for compact storage in a pantry or small cabinet. This Oster waffle maker has a one-year limited warranty.